People today tend to live busy lives, being pulled in many different directions daily. It can become easy to ignore the needs of pets. That said, dog owners need to pay attention to their dog’s mental and physical well-being. One key component of this is exercise. Your dog should be getting proper exercise, which typically includes going on walks, playing around at dog parks, and, of course, playing “fetch” with a ball. Why should dogs exercise often? 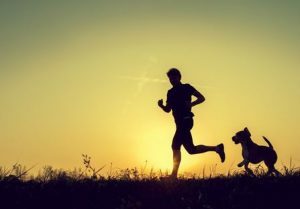 Well, regular physical exercise helps a dog maintain a “normal” body weight (rather than get fat), promoting both “quality of life” and longevity, too. If you don’t want your dog to experience “premature aging,” then make sure he or she enjoys at least a 20-minute walk daily. If you don’t want your dog’s bones to degenerate, physical activity is important because it keeps those bones strong. Dogs weren’t designed to just sit around all the day, never moving– instead, they do well walking, running, and moving, often. If you don’t want your dog to suffer with arthritis, did you know that even if the dog does have it, exercise helps alleviate the pain? A dog with a sedentary lifestyle is going to develop the kind of loose connective tissue that stores fat, increasing inflammation potential, and, therefore, worsening the pain of arthritis. So, don’t let that happen– get your dog movin’ and groovin’. If you don’t want an obese dog, which means your dog is at a higher risk for all the bad stuff like diabetes, cancer, depression, dementia, etc., then have him or her exercise often to keep their weight at a “normal” level. Finally, know that exercise has numerous benefits, including good stuff like improving insulin health and metabolism, pumping toxins out of the body, and giving your beloved pet much-needed attention and mental stimulation. Want to know how D’Tails exercises dogs who stay here? Visit to see or call and ask! The number is 706-731-0089.